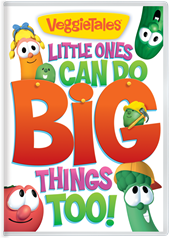 The boys just love the last Veggie Tales dvd we reviewed, so when given the opportunity to review their newest release, I was excited. Little Ones Can Do Big Things Too is a collection of stories about little ones who did BIG things with God's help. Each story has an underlying lesson, such as learning to listen to your parents, or the importance of kindness. It includes fun and catchy songs, like the other Veggie Tales dvds, and the running time is 95 minutes. This was a little lengthy for my three boys, so we tended to watch half of it at a time. When I asked Pierce about his favorite part, he immediately referred to the story Pistachio: The Little Boy who Woodn't. It's an off-shoot in some ways of Pinocchio, as Pistachio is created from wood by Gelato, but then doesn't want to have to listen or respect Gelato. My boys were completely captivated by Little Ones Can do Big Things Too, and I approve of its wholesome lessons and messages. You can find it at retailers for $12.99. Disclaimer: I received a copy of this dvd for review purposes. The opinions stated above are my own. I love these movies too. They have such a wonderful message. What cute DVD. I might pick this up when I'm back in the States this winter. Love that all three were caught up! That says a lot! Ben loves Veggie Tales.. This would be a good one to get him . Anything that can give foundation to God is a wonderful thing to watch.. Our children as well as us need that foundation to carry us through life. God loves us so much..It's like putting soda into a glass with water and then pouring vinegar on top.. It just foams right out of the glass. I tell my kids and grandkids that is how much God loves us.. I will be sure to tell my sister about this one for her granddaughter. Thx and enjoy your day. I've never see any of these DVDs, but it sounds like they're fun and wholesome for the little ones. Veggie Tales is such a wonderful Christian cartoon! Love it! Glad you got to get the new one and for FREE! Yeah! Oh, the Veggie Tales years...sniff, sniff. I remember the first Veggie Tales I watched with my kids...took me awhile to get into to them, but ended up enjoying their funny characters! I'm going to check this one out for my grand's. Sounds like it will be a good one for them...I hate all these other so called children's programs/movies. Thanks for sharing. Have a nice week! 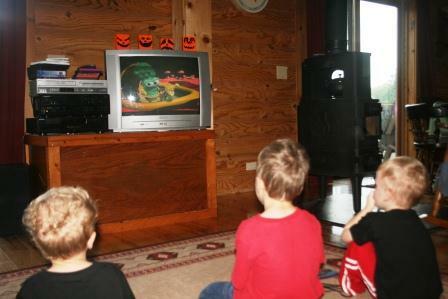 How wonderful you allow your boys to watch Veggie Tales! Not sure if my Grandson likes Veggie Tales or not. Probably, he likes most kids shows. I remember Veggie Tales from quite a few years ago. Can you guess if I like Veggie Tales or not? I love them. Glad they get to see them too. Can't go wrong with a Veggie Tales DVD. Sounds like a good one.